There is a very personal interview with Per in Svenska Dagsbladet. They did the interview at BMG’s office in Stockholm. Per talks about music, songwriting, the new albums, the duets, Roxette, Gyllene Tider and his family. How he talks about his mother will bring you to tears. 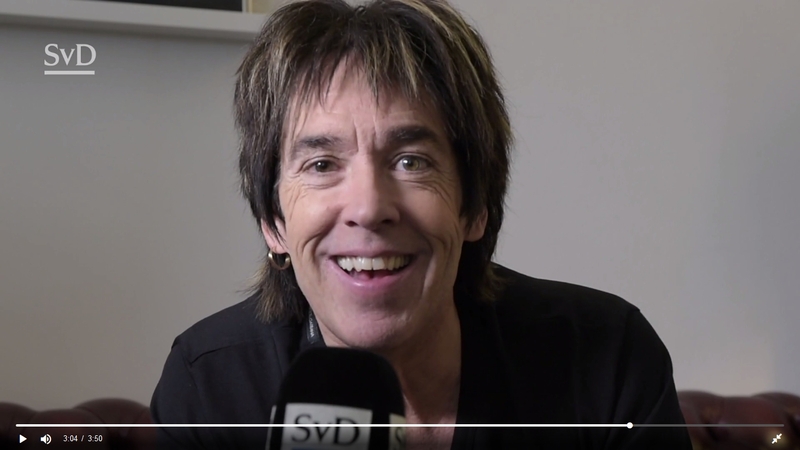 The article starts with stating what we all know well, Per Gessle loves talking about music. He loves ’60s music even if he was only 6-7-8 years old when the best music was released. At the age of 10 he already owned 100 records and was looking for the ”hook” in the songs. He listened to The Beatles’ Dizzy Miss Lizzy 25 times in a row. He still had his Roy Orbison-style glasses when he started his first band, The Pepcis. They were only miming to songs of e.g. The Animals. They are talking about that Måndagsbörsen show from 1981 where Per appeared in his red trousers, red tie and long blonde hair. Per says he remembers it like yesterday. He was damn nervous, because it was all live and it was scary back then. It was hard to do interviews, his generation was not so good at talking. But over the years he has become an analyst of himself because he talked so much. Per says in the interview that they didn’t start Gyllene Tider only for becoming known. They wanted to reach out with their music. He doesn’t know whether they wanted expensive cars or be chased by girls. They wanted to stand there and play and be accepted. Regarding why he recorded his upcoming albums in Nashville Per says Åsa calculated that he spent 420 hours in Skåne in Christoffer Lundquist’s studio and he felt that he needs something new. Then came Nashville in sight, even if he is not a real country guy. He thought he would make a fusion of Halmstad and Nashville. He had 14 songs with him and thought it was a little bit too many for one album. Then the idea was to make two records. En vacker natt (out on 28 April) and En vacker dag (out on 1 September). In addition, Per had a couple of songs in English left and wanted to do duets with American country singers. He says he wanted to sing with Alison Krauss and ran into her in the elevator but she was so angry, something had happened, so Per didn’t dare to ask her. Then he called his friend Scott Borchetta, who owns Big Machine Records and is Taylor Swift’s manager. Scott suggested a duo, The Church Sisters because one of the sisters, Savannah Church sounds exactly like Alison Krauss. Per sent his demo “Far too close” to her and she immediately replied that she loved the song and came to the studio to sing. She was singing so well it took only 20 minutes to record it. Per Gessle’s good friend, Roy Orbison Jr., son of the legendary singer suggested they should have Roy Orbison’s guitars on the album. So now it’s as if he blessed the recordings. On the new album there are several songs about love. Per says it’s a topic he is always writing about. The difference this time is that he is getting older. He doesn’t want to write about love as if he was still young. “Några glas rosé” is for example a song he couldn’t have written 15 years ago. Per says melancholy, sentimentality and romance are grateful to write songs about. To the question if he writes texts quickly he replies he does. If it doesn’t happen, then the text is not good enough. If he picks it up again three weeks later, he has lost his point of view, sees the text from the outside and may not understand what he meant before. So he doesn’t understand how Leonard Cohen worked for 5 years on writing “Hallelujah”. In the song “Allt gick så fort” (= Everything went so fast), Per Gessle sings: ” De plockade upp en kvinna från vattnet / Strömmarna hade blivit för starka / Ett mini maximum / Allt gick så fort ” (= They picked up a woman from the water / The currents had become too strong / A mini maximum / Everything went so fast”). The text is inspired by an accident Per witnessed during a visit to France. Fortunately, the woman was rescued from drowning. This song is the album’s hub. Per says he read an interview with David Crosby who told he had five guitars in his bedroom and that all of them were tuned differently. Per tells Svenska Dagbladet that he has almost always played with classical guitar tuning, sometimes he turned down the E-string to D. Crosby and even Joni Mitchell did it a lot. Per wanted to write a text of different self and time concepts mixed with the harmonies of unusual guitar tuning. In the interview Per also talks about the duets on the new albums. He says when singing a duet with a girl, it is perceived as if they sing to each other. Also in the country world with songs like “Jackson” and “Did you ever” with Nancy Sinatra and Lee Hazlewood where they constantly answer each other. Per has used this technique in Roxette but also that the guy and the girl are singing towards a common goal. When two guys sing, the text becomes completely different, like in “Småstadsprat” (duet with Lars Winnerbäck), when they don’t sing to each other, but to a third person, a girl. Per tells Svenska Dagbladet that John Holm was one of those who made him start writing songs as a 14-year-old. John gave Per so much self-confidence, because he had such a strange voice and Per also has a strange one. When John played in Halmstad some time ago, Per went backstage and greeted him. Then this fall he played at Scalateatern in Stockholm and Per asked him if he wanted to sing a song on his album and John was in. Per says John Holm is someone who doesn’t really know how good he is. Next year Gyllene Tider celebrates its 40th anniversary if, like Gessle, we count it from the time when the yellow EP was released in 1978. If there will be a tour to celebrate it, Per says they will tour for sure, but it’s not sure when. If it’s next year or the follwoing year. He really wants to play with Gyllene Tider, the world’s best powerpop band along with good old Tom Petty and the Heartbreakers. Regarding Roxette Per says the touring period is 100% over. Marie can’t manage it physically. Per tells Svenska Dagbladet that Marie now feels relatively good and they meet occasionally. She has just been in Spain and had a little sunbathing. Per says he won’t ever replace Marie with another singer. Roxette is Marie. But he can imagine playing some of his songs in one way or another. It would feel strange, for example, never to play “The Look” or “Listen To Your Heart” again. On the cover of the new album “En vacker natt” is a picture of Per’s sister Gunilla. Gunilla’s son found a box of 1960s pictures, including the picture as she stands and sings on a dock with just a glove like Michael Jackson. The entire album is dedicated to his sister. She died last autumn. Per’s mom died in 2013, his brother Bengt in 2014 and now his sister. Now Per is the only one living from his family. Per says it has been difficult, especially when his mom died. She was 88 years old. His brother had lung cancer but he didn’t tell anyone, not even to the closest family. His sister also had cancer and they knew it would happen but not when. It’s tough, of course. Svenska Dagbladet asks Per if it appears in any way in the lyrics. Per says he doesn’t think there’s a song about the grief, but he thinks he changed when everyone passed away. It became an old age issue for him and he reflected on things in a different way. When something is happening in one’s life, like a close relative passes away, sadness never leaves. It’s coming and going. On the album cover of “En vacker dag” there will be a picture of Per’s mom on picnic in front of their old Volvo Amazon 1965. Per says he never heard her sister singing, but his mother sang a lot, she was a real loudmouth. Per tells Svenska Dagbladet that he met his mother a couple of days before she died and then she had pain in her back, but there was nothing more about it. The next day she called Per’s sister Gunilla and said she had a severe pain and then Gunilla urged her to press the alarm button because it is a bad sign of the heart with such pain. When the ambulance arrived, she told the drivers she would only finish the apple cake to her neighbor who had name day. Then she got a stroke or heart attack in the kitchen and they tried to revive her. Per thinks it was nice to die in the generosity, it fitted his mother. The interview is closed with a thought about Per’s brother. The great legacy of him was all his records, thanks to them Per got dragged into the beautiful world of pop. There is a fact sheet at the end of the article. There Per tells his wife Åsa is called Woody after a Woody Allen movie and his son Gabriel, 19, is studying computer programming at KTH. In an earlier interview Åsa said while laughing that Per always drinks filter coffee at certain times like an old aunt. Per laughs and says it’s not really true, but he sticks to his habits and always eats the same breakfast for example. He doesn’t mind that if he is on tour it will be a different kind of breakfast. But if he is at home, he wants the same bread, butter, ham, mustard and cheese. Per is doing a radio podcast “Gessles nio i topp” on Swedish Radio and in the coming season he chooses “Nine songs you wouldn’t believe I loved”, “The nine most underestimated artists” and “The nine most forgotten artists”. Great interview and very nice article. Thanks a lot for this, Svenska Dagbladet! PG in the SvD video where he talks about 5 songs that mean a lot to him now.